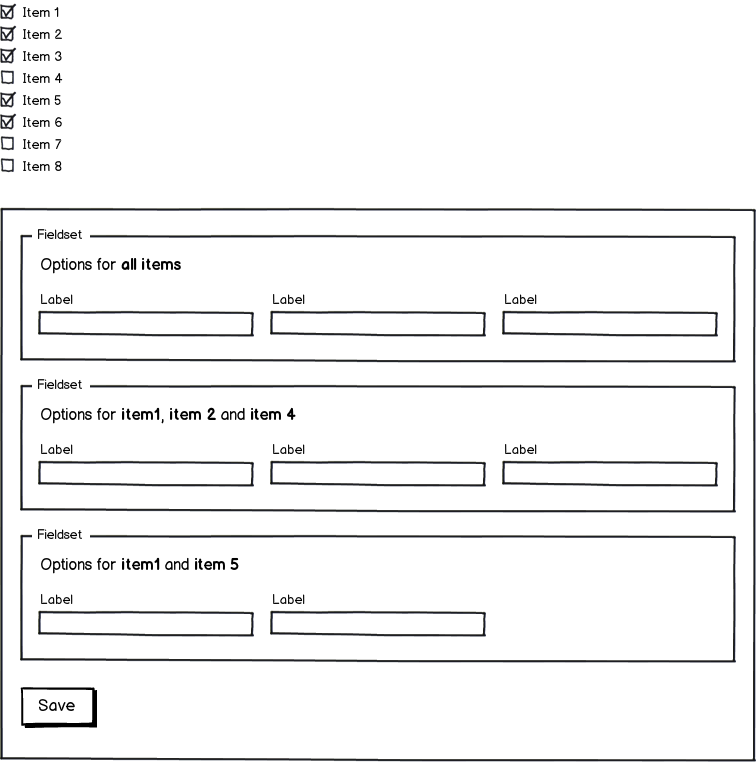 Working on a form, which applies a configuration to an object selected from a table. Multiple objects can be selected to have one configuration applied to all selected. This approach works fine when each object shares exactly the same form field values as the other selected objects. However we have now been told that in some instances multiple shared objects will alongside common shared values have unique values as well. So I am trying to explore design patterns or find examples as guidance as to how this can be achieved. One option is to restrict user to only selecting one object if it requires any unique values submitted from the form. This could make the applying of configurations very tedious if they need to configure more than a few objects. Or if they select for example 5 objects, all the common form field values are shown once, and the unique form field values in this instance are shown 5 times, once for each object. I am not asking a specific question but looking for ideas, options, information from anyone who has worked on something similar. I think I'd consider showing all the common settings, then grouping any other shared settings. In the crude example below, I'm showing the options that are shared by all selected items, then the options that are shared by items 1, 2 and 4, then the options that are shared by item 1 and 5. That way, I'm free to select any combination of items and it's reasonably clear which settings apply to which items. I've had a similar situation where multiple rows in a table could be selected and then modified. I added an edit dropdown menu above the table where the user could select which property to bulk update for the selected rows. When selected, a modal appeared with a form with just one property that would then be applied to all the selected rows in the table. You could use the same method and only apply the new value to table entries that have that property. You could even add a little line saying how many rows would be affected etc. Not the answer you're looking for? Browse other questions tagged forms tables data-tables or ask your own question. Form design to enter many values?